Unique, contemporary with splashes of colour, The Peninsula says interior designed all over it. 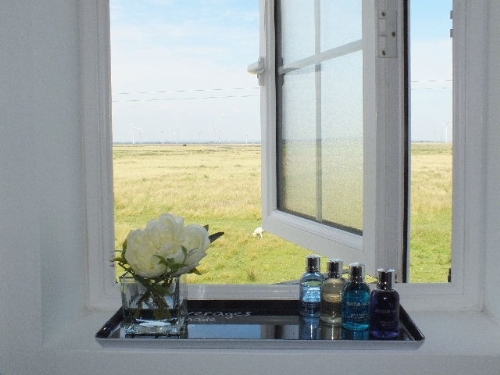 The Peninsula is a self catering holiday cottage in Sussex, within five minutes walk of the most wonderful sandy beach of Camber Sands, a perfect family holiday destination. This cottage has been interior designed and exquisitely finished with spectacular uninterrupted views over the surrounding nature conservation farmland. Product : Would not trust photos on this site. Thank you for taking the time to review your recent stay at The Peninsula. We can confirm your comments have been relayed to the owner. The Peninsula has a strict maintenance schedule and is regularly updated. Many thanks. Product : The peninsula, was clean, tidy, user friendly, a short walk from the beach and very peaceful. Great place to stay for nature lovers. Service rating : Das Ferienhaus war bei der Übernahme was den Reinigungszustand anbelangt nicht annähernd so vorzufinden, wie man es erwarten kann. Wir waren gezwungen, insbesondere in Küche und Badezimmern erst einmal eine Grundreinigung durchzuführen! Product : Das Ferienhaus war bei der Übernahme was den Reinigungszustand anbelangt nicht annähernd so vorzufinden, wie man es erwarten kann. Wir waren gezwungen, insbesondere in Küche und Badezimmern erst einmal eine Grundreinigung durchzuführen! Service rating : Very efficient. Kept well informed. Product : We found the Peninsula very well equipped and very clean. Our grandson is 2 and we found that the Peninsula catered so well for young children. Product : Concierge numbers on the docs Mulberry sent were wrong. The correct ones were in the book at the property. "Thank you for a lovely week in your house, we had a great week and really appreciated all the space in the house. It was so nice to wake up and see the sheep in the morning. The toys were brilliant for our children. Thank you for the lovely welcome snacks as well!" "Thank you for letting us stay in your amazing house. The town is so cute!" "Thank you owners for letting us stay in your house, we loved seeing the sheep." "Thank you for letting us stay in your beautiful house. We had so much fun. We loved waking up and seeing the sheeps and lambs." "We had two excellent weeks in your beautiful and quiet house, enjoying the close beach and the area around. There was everything we needed to spend a relaxed holiday. The beach was so close and there was no need for a car. We even got fresh fish and loved cooking it in your well-equipped kitchen. Thank you very much for letting us stay in your house! We will miss the sheep in the morning!" "We simply love your holiday house, - thank you for letting us stay here this wonderful week. We knew from the internet that it was great, but it turned out to be even better !!!" "Thank you for letting us stay in your lovely house for two weeks. We had a wonderful time with lots of sunshine and beautiful days out in the country. As we arrived we didn?t expect a time as we had. Definitely we will share these wonderful impressions of your house and of the area with our friends. Our three kids and us are not willing to go home but we have to. Again thank you for an outstanding time in your house." "We loved your house, nice view, rooms and the distance to the beach is in walking distance. Rye is a very nice place and for small children there is a lot to do nearby (Blue Reef, Clambers, playground Rye). The takeaway simply spice was superb! Thanks a lot for the welcome basket!" "We had a lovely time at your home. A nice, quiet place to have a relaxing break. The facilities were good and the provision of adequate utensils in the kitchen was fantastic. Keep up the good work." "We had such great holidays. What a wonderful place to stay, a home away from home. With everything you need and even more. What a wonderful landscape and all the fantastic places to visit. What a spectacular beach. Thanks"
"Thanks for a great time at your home. The weather matched our expectation .... very British . but the standard of the home was definitely above expectations! A good place to be for a quiet and relaxing vacation!" "We had a fantastic week in your lovely house. Not only was everything excellent within your house, we had perfect weather! The sun shone throughout our week so we felt very lucky, especially after the record bad weather summer of 2012. We took advantage of the play things provided for our 18 month grandson and appreciated all that your house provided in every respect. We would love to return some time in the future." "We had a lovely stay and luckily the weather was kind. Lovely views and a nice local beach and lots of nice places to eat nearby too including webbes fish restaurant and the Plough bistro. The privacy here was nice and the quiet nature of the place was very relaxing. Thanks for a lovely stay!" "We had a great time in your lovely house - thank you! The weather was great and we really enjoyed the beach and all the great views. The Olympics were fun too!" "Thanks a lot for welcoming us in your wonderful holiday home. We really enjoyed our stay and the beautiful view all over the fields, and of course the absolutely fantastic beach! On Friday, we travelled to London by train to watch the Olympic Games which was very cool and funny although the whole town was a lot more crowded than we expected in the first place. Nevertheless, everything went quite well, thanks to all the volunteers who showed us the way!" "First of all, thank you for the welcome pack which was very much appreciated. In spite of poor weather, we enjoyed our week because of your wonderful and well-equipped house. The enclosed garden was important for the children, and the privacy was a bonus we did not expect, it was also nice to have access to the garage for pushchairs and wet weather play area! Many Thanks"
"We had a wonderful stay at Peninsula! Despite the appalling weather, we managed to fill our days as we wished. A few days at the beach, a trip to Brighton, several trips to the wonderful Rye. We will surely recommend it to anyone who's interested. We may even come back ourselves, as we really like the surroundings! The house was really lovely! I can see myself living there full time :-) As we have learned over previous vacations, these houses are always a compromise to the comfort you have at home. With the Peninsula, this was totally not the case. We had as much comfort as we have at home, with the added bonus of a wonderful view! :-)"
"Thank you! One of the best homes on the estate because of the view - my kids were captivated by the sheep, lambs, rabbits and wind farm. And the estate is very close to the best stretch if Camber Sands - which is completely breath-taking. We'll be back!" "Just to say thank you for renting us your home, we had a fabulous week there. Absolutely loved Camber Sands and Rye! We really liked the decoration and the beds were very comfortable. We would certainly recommend it to friends. Thanks once again." "Thanks for staying in your house, the views are perfect. Reminded us of Holland! We loved Rye as well, we had dinner in the George and a few drinks. Very nice." "Thank you for a fantastic stay! We loved the view, it's beautiful! We had a fantastic time with the lovely beach, fab food at the Gallivant, Rye, Dungeness, the Romney, Hythe & Dymchurch Railway. Such a lovely house. A beautiful break for the family!" "As we have never travelled to this part of the UK, we did not know what to expect. Now we are more wiser on the subject. Looking out the French doors of The Peninsula we were flabbergasted at how homely it made us feel - the forever lasting fields kept us close to our home back in Hednesford. Our first ride out to Rye was interesting and as yet it surprised my dad; such a lovely little town, he said. The house was welcoming and the atmosphere was friendly. Thank you for letting us stay in your spectacular house and helping to make our holiday just that little bit better." "Thank you for letting us stay in your lovely holiday home as your first renters! We have rented many many times before in the area and we value the higher end rentals as holidays are precious to us and we don't get many. As such we loved your place. We had a great time and love the decor!" The Peninsula is a family friendly holiday cottage, it is fully equipped with cot bed, baby Moses basket and high chair, it also offers a dining booster seat, alphabetic child playmat, and child umbrella. Toys and games include scooter, puzzles, beach toys and garden toys.